Berries and Leaves Placemat designed by Margaret Travis of Eazy Peazy Quilts for Cut Loose Press measures 13" x 16". 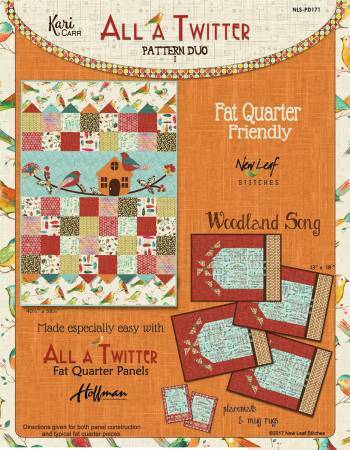 BQ Goes MinI from Maple Island Quilts. Cutezy CupCake Placemats by Eazy Peazy Sew So Easy requires Bosal's Craf-Tex Placemat Craft Pack. 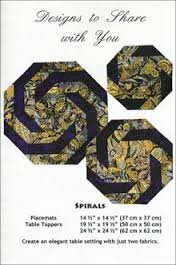 Four-Patch Placemats or Pillow by PJ Anderson for New Beginning Designs is a placemat approximately 15" x 18". 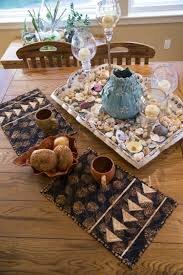 Pinecone Mocha Placemats by Judy Niemeyer and Judel Niemeyer Buls of Quiltworx is a pattern for placemats measuring 13" x 20". 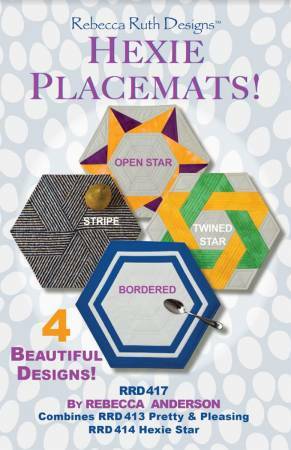 Hexie Placemats by Rebecca Ruth Designs measures 14" top to bottom and 16" across. 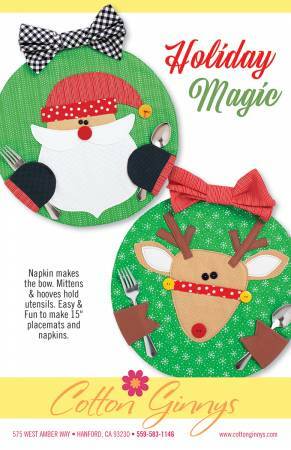 Holiday Magic Placemats & Napkins from Cotton Ginnys. These charming 15" placemats include Santa and his Reindeer. Mittens & hooves hold utensils and napkins that make the bows. 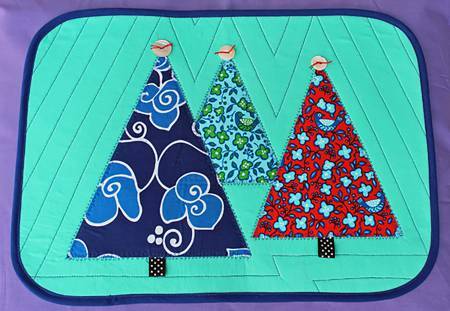 Holiday Placemats from Cotton Ginnys. These festive and easy to make 15” placemats include a Santa, snowman & turkey. also great for centerpieces and gift giving! 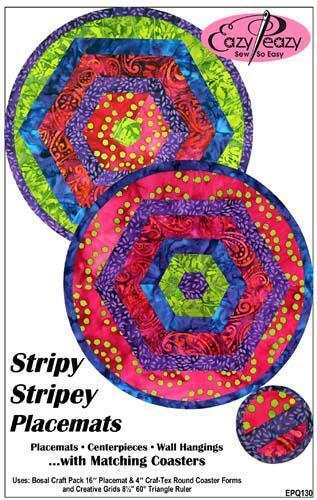 Inside Out Mats from Poorhouse Quilt Designs. Measures 12.5" x 17.5". Just Weave It woven placemats from The Sweet Tea Girls Patterns are made using jelly roll strips plus a few coordinating blender fabrics. 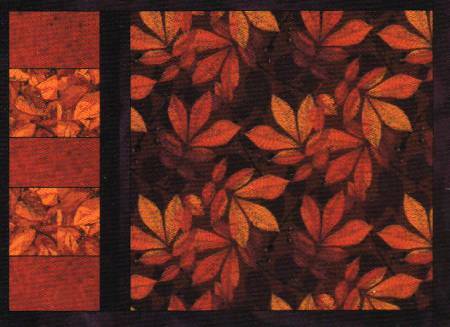 They can be embellished with fusible applique if you choose to highlight a season.They measures 12" x 18". My Chicken Kitchen includes the bread bag, placemat, egg napkin ring and napkin. The bread bag measures 8" x 12" and holds a dozen or more rolls while bread is kept soft and warm without exposure to air. On the Side - Quilt-As-You-Go Placemats from QP Quilts and Company. Owl Mats from Desiree's Designs are 16" round placemats. Playful Points Placemats from Easy Peazy Sew So Easy fits any shape Bosal Craft Pack Pre-Cut Forms.with a bonus table runner pattern. 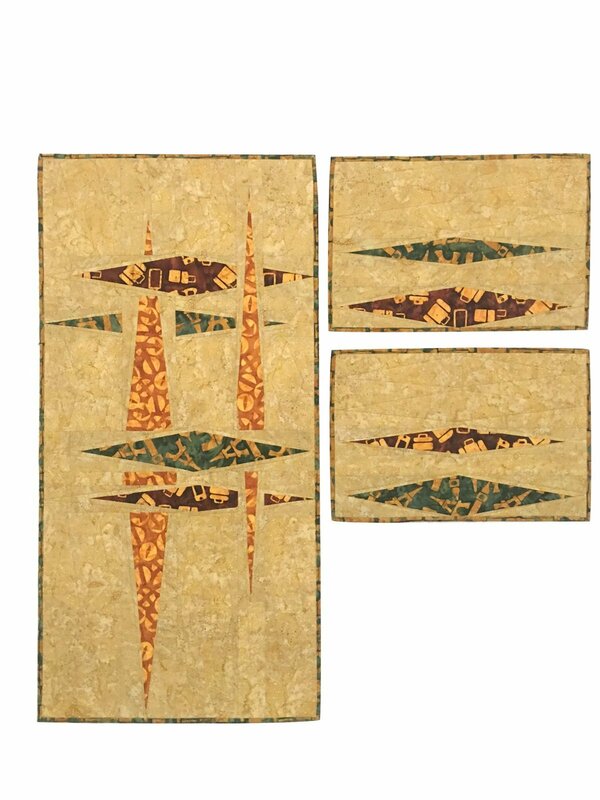 Safari Mats from Desiree's Designs. 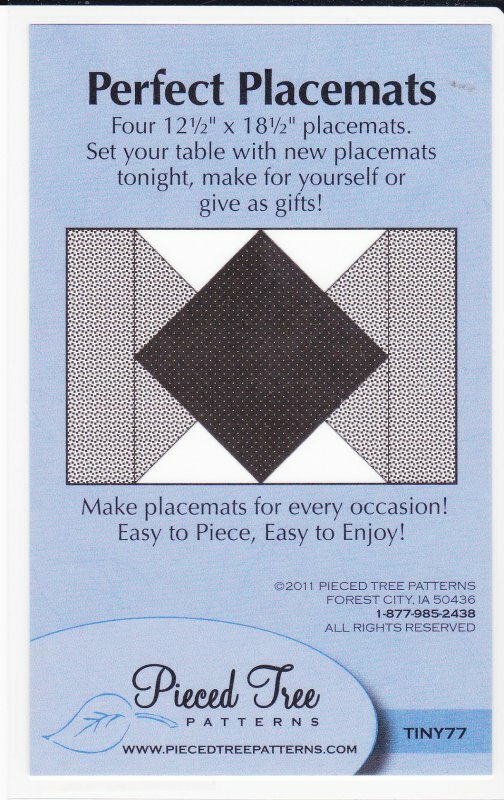 16-1/2in x 13-1/4in Oval Place mats. 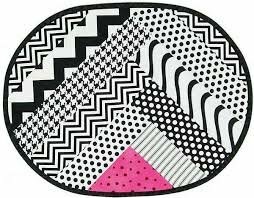 Uses Bosal Oval Craft Tex Double Sided Fusible Placemat 16-1/2in x 13-1/4in. (PM-2B). Elephant fox zebra and giraffe. 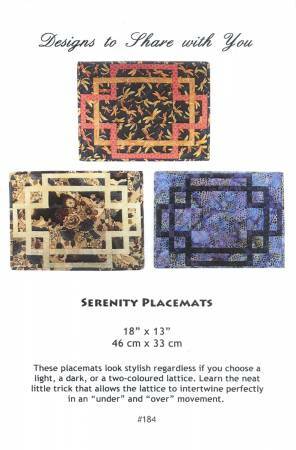 Serenity Placemats from Designs to Share with You measure 18" x 13". Set of 6 Hexie Placemats by Gudrun Erla of GE Designs is a pattern for placemats that measure 15" x 17"
Stained Glass Placemats by Kris Holderness for Cut Loose Press measure 12" x 18". Stripy Stripey Placemats by Easy Peasy Sew So Easy is a pattern for placemats centerpieces or wall hangings..with matching coasters. Uses: Bosal Craft Pack 16" placemat & 4" Craf-Tex Round Coaster Forms and Creative Grids 8.5" 60 Degree Triangle Ruler. Triangles from Design to Share with You. Runner is 13" x various lengths. Placemats are 16.5" x 14". Vintage Spring Bouquet Placemat by Bill Locke for Cut Loose Press. 14-1/2in x 18-1/2in. Project Time: 2-6 Hour. Fabric Type: Fat Quarter Friendly. Project Type: Stitchery. 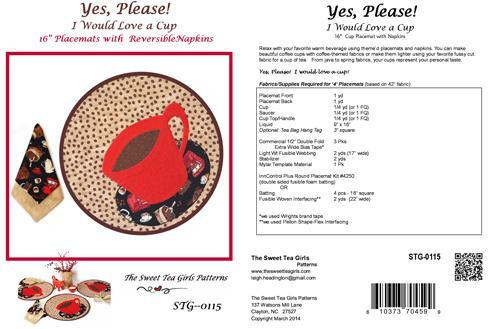 Yes Please I Would Love a Cup from The Sweet Tea Girls is a pattern for 16" placemats with reversible napkins. Center Stage is a pattern by Qp Quilts & Co. Quilt as you go placemats that are a great way to use all of the fun novelty prints available. 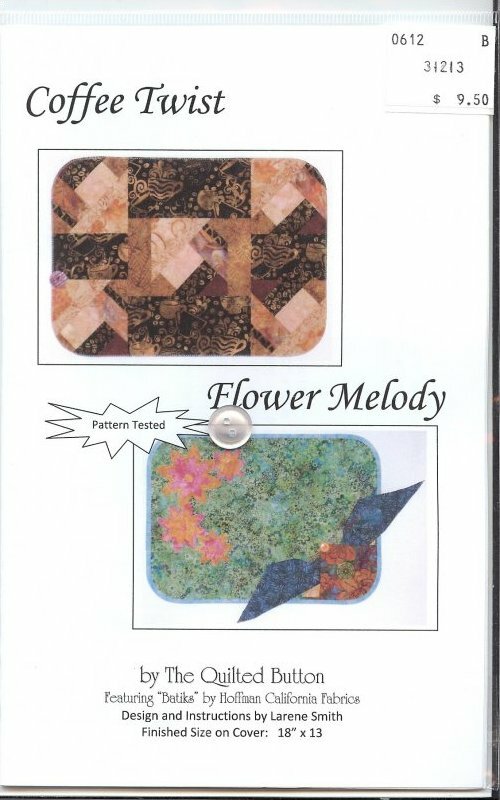 These two patterns 'Coffee Twist and Flower Melody' each make a wall hanging 18 X 13". 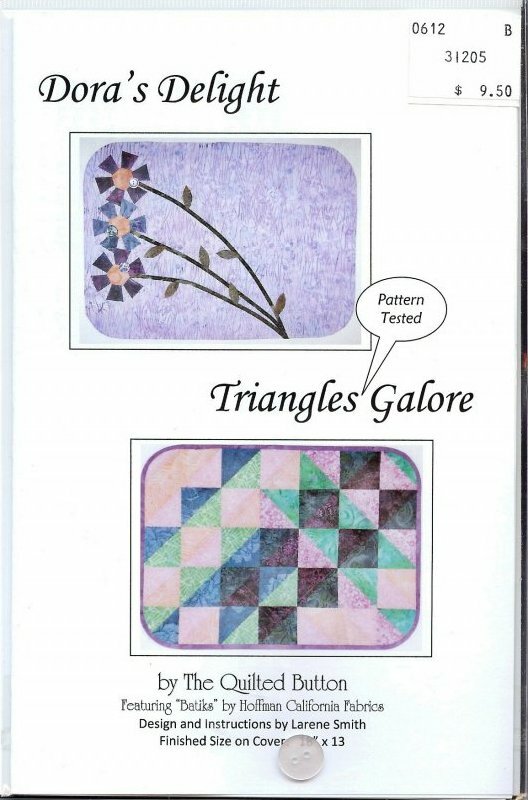 These two patterns 'Dora's Delight and Triangles Galore' each make wall hangings 18 X 13". 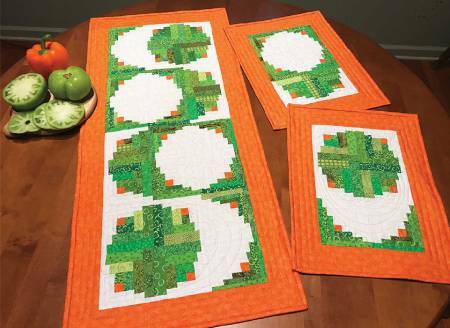 'Gift Box' is a quilt as you go Placemats pattern by Qp Quilts & Co. Novelty prints can be used for each month. 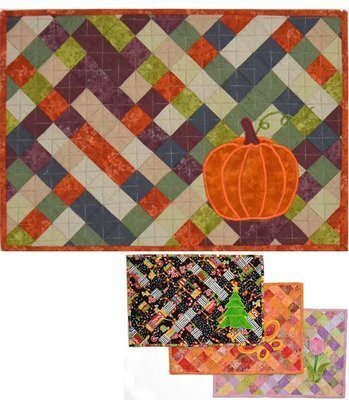 Perfect Placemats is by Pieced Tree. It makes four 12 1/2 X 18 1/2" placemats. 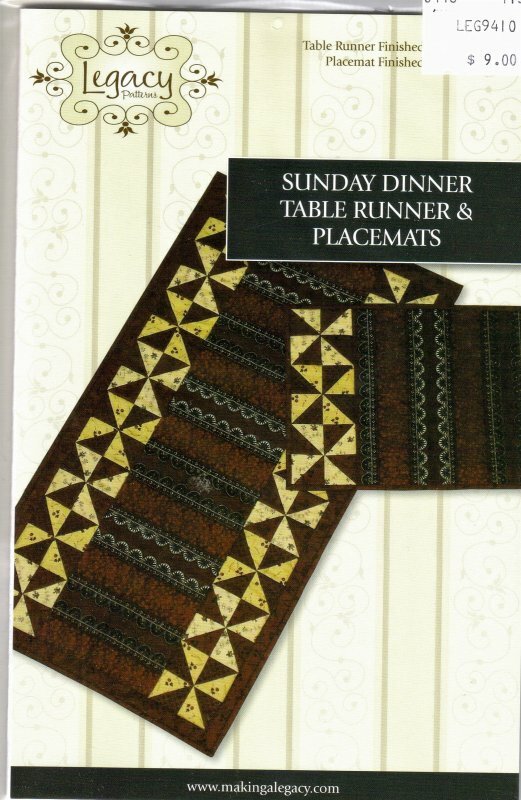 'Sunday Dinner Table Runner & Placemats' is a pattern by Legacy. 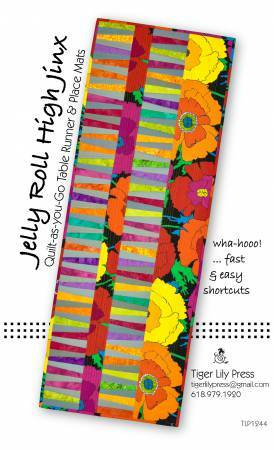 It makes an 18x34" table runner and placemats 12x18".